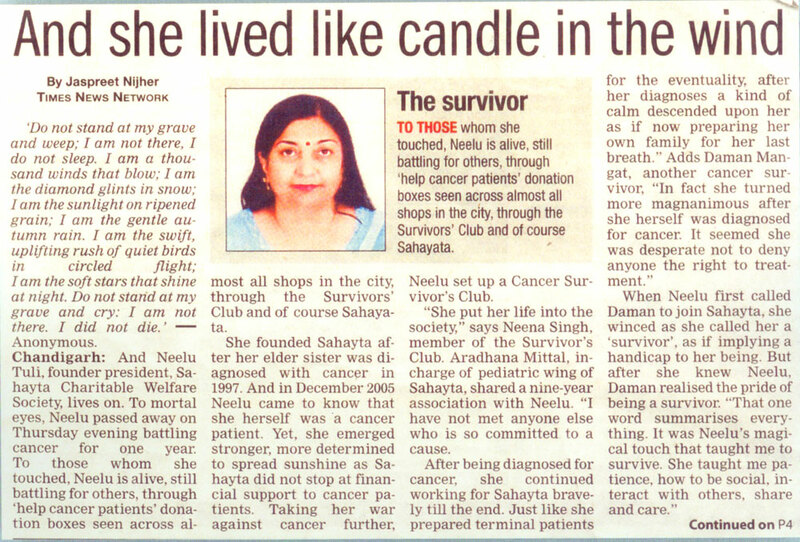 Sahayta was started in 1997 by Neelu, after her sister Renu, was diagnosed with cancer. Fortunately, her sister recovered but having seen how traumatic the experience was for their family even when the cost of the treatment was not an issue, she decided to start a volunteer organization that would provide a helping hand to cancer patients most in need of financial support. Neelu, a housewife who had no prior work experience, started Sahayta with a budget of just 5000 rupees ($100), and grew it to an annual budget of 20 lakh rupees ($40,000) and an army of 60 volunteers within nine years. 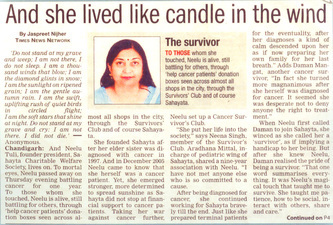 Neelu was herself diagnosed with late stage cancer in 2006. In-spite of her condition she continued to lead the organization till her last days. She tragically passed away just a few months after her diagnosis. The organization is now headed by Ms. Renu Saigal, her sister.